The Rangers lose a set for the first time this year, but still roll into the semifinals with a 15-0 record. CUMBERLAND — Judging by Gorham’s celebration after the third set, or the way the Greely players dropped their heads, you wouldn’t know their volleyball match wasn’t over. Or that Greely led two sets to one. Morgan Selby of Greely sets the ball against Gorham, which became the first team to take a set from the Rangers this season. The emotions arose because Greely lost a set for the first time this year. But the Rangers recovered quickly end eliminated Gorham in the Class A quarterfinals with a 25-16, 25-17, 21-25, 25-9 victory Saturday. The top-seeded Rangers (15-0) advanced to the semifinals Wednesday against No. 4 Falmouth (13-3). No. 9 Gorham is done at 10-6. Greely beat Falmouth during the season 3-0 – but then the Rangers beat everyone 3-0 this year until Saturday. It’s a dominance Greely embraced. When the Rangers won the first two sets, a sweep seemed inevitable. Except Gorham wasn’t folding. The first two games were hard-fought. 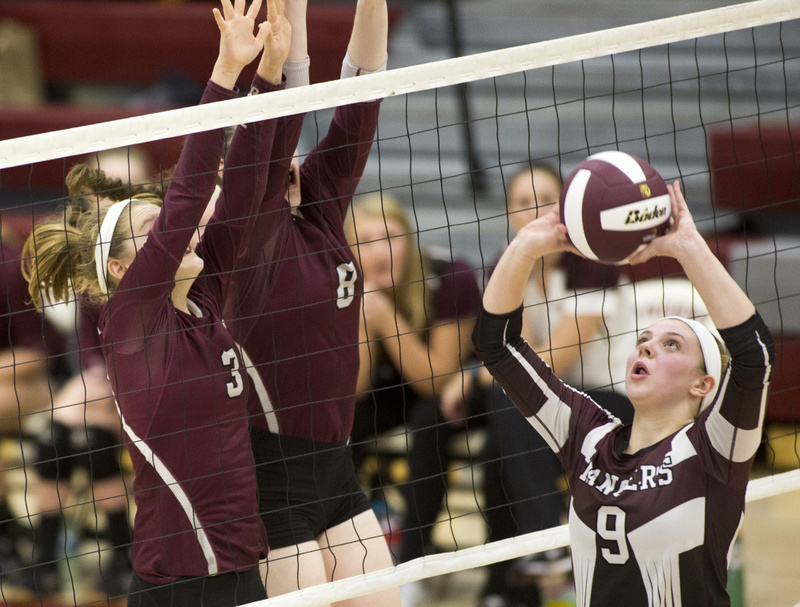 Diana Kolb and Kristen Curley were powerful outside hitters for Gorham and, combined with Caralin Mills and Katherine O’Donnell, were effective blockers to the Rangers’ power game. “Gorham is a very good team and we knew that coming in,” Molly Chapin of Greely said. “Very big blocks. We had to work on hitting around them. Gorham was losing but Coach Nicole Rizzo was applauding. Still, Greely outplayed the Rams in those first games, with setter Morgan Selby finding her powerful hitters in Chapin, Kayley Cimino and Sara Agren. In the third game the Rams jumped ahead 12-8 and Greely called a timeout. Gorham made it 17-10 with Maiya Carlson serving four straight points, and Greely called another timeout. 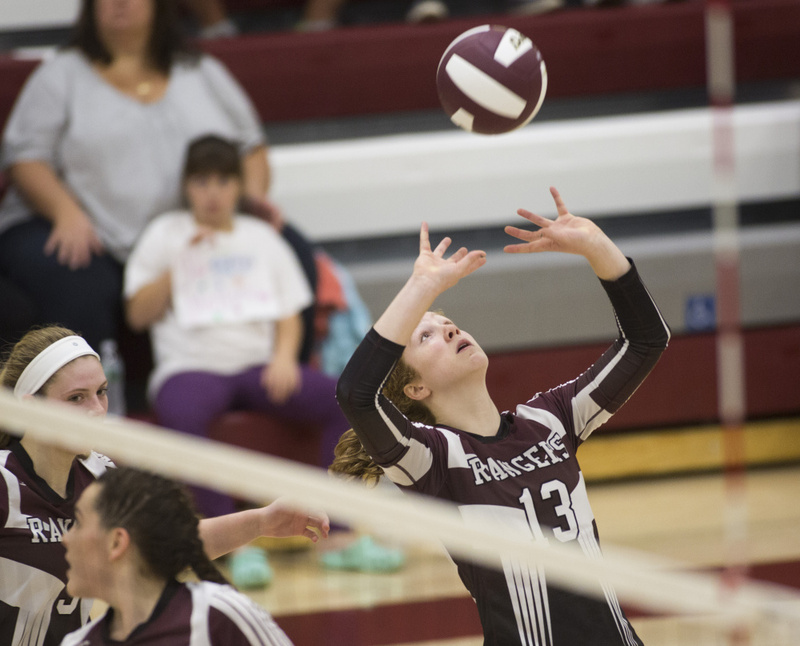 Greely rallied but the Rams held on, with setter Isabelle Kolb pacing the flow for a 25-21 win. The Rams were whooping and hugging. Hasch approached his upset players. With Agren serving 10 straight points on aces, winners and Gorham errors, the Rangers took a 14-1 lead. “I think we got too excited and lost our focus a little bit,” Diana Kolb said. When Gorham got back to its passing and setting up hits, Greely was there to block. The Rangers finished off Gorham and were soon celebrating. “It was hard to lose a set after such a great season, but they earned it. Good for them,” Chapin said. “Something we can work on and learn from this.